Mr. Konne, a 2014 program participant from Yale University. Today, a 2nd year medical student at Carver College of Medicine. What led to your interest in a health profession? What initially intrigued me about working in healthcare was learning about the impact that health has on people. Growing up, I enjoyed learning about scientific things. In the medical profession, everything that is known is constantly changing, and it’s a field where I’m able to keep myself engaged and focused. I also felt that I was my best self when I could help others. It was senior night at my last high school football game. We had won the game, and everyone was filled with excitement. Mothers and fathers rushed the field with pride. My mother and father had to work that night, so I received hugs and kisses from my best friend’s mother. We talked about all the exciting catches, runs, and tension of the previous game. As the night began to simmer, our conversation switched over to college and what I was interested in for the future. In that moment, I realized I hadn’t given serious thought to my future. What would I be doing in 20 years? I had plans of attending college but nothing concrete past that. My friend said, “You could be a doctor man, you’re definitely smart enough.” His mother agreed, and I was mentally floored. As two people confessed their vision of my potential, I was inspired to dream bigger. Their words challenged me to explore the medical profession which led me to apply to SMDEP where I learned more about what it takes to pursue medicine as a career. What obstacles did you overcome in your educational or career journey? I entered college with an average high school GPA. Even with in-state tuition the cost of education was always something that worried me. If becoming a healthcare professional was more than just talk, I needed to prove it to myself. I set high goals for myself in the first two semesters of my undergraduate education. The study habits I fostered that first year carried me through the sophomore and junior year. When the time came to take the MCAT and apply to medical school I felt the same pressure to “prove to myself”, that I deserved to do what I was doing. Even now in medical school going into my second year, I still feel the need to prove to myself that I deserve to be here. Imposter syndrome has been a recurrent educational obstacle. The irrational fear of inadequacy is something that I deal with on my journey toward becoming the physician I aspire to be. I’ve learned to lean on my friends, mentors, and professors in times of doubt. Meditation and mindfulness techniques help to center my outlook when doubt attempts to subdue my aspirations. In 1997, my family emigrated to the United States. My mother, sisters, and I arrived in the Iowa in the early months of winter. We left Nigeria as refugees fleeing a civil war that threatened our lives. We made our way to a refugee camp where we were fortunate to be sponsored by a church in Iowa that helped facilitated our emigration. For many years, it was just my mother working to provide for four children. As children, we learned to take care of one another. We usually only saw our mother in the mornings before school and maybe at night if we stayed up long enough. This early period of my life taught me responsibility and the importance of looking out for one another. It also shaped my world view. Looking back, I recognize the hard work and sacrifice my mother endured to provide a life for her children. I hope to show the same tenacity in the face of adversity moving forward in my medical career. What surprised you the most about professional school? I knew and was always told about the difficulty of medical school. The metaphor of drinking water from a fire hose was a recurrent description of the volume and pace of material presented. In hindsight, the metaphor was quite apt. I expected the material to be difficult, but what I did not expect was the amount of help and support provided by the Carver College of Medicine. The most surprising thing about medical school so far has been the number of people who just simply want to see you succeed. The support provided extends beyond just academic support but also in its coursework and policies. The grading system is structured to facilitate students helping each other to master the material rather than competing with each other. We also have wellness checklists which is a form we fill out a few times a year where we write what we have done to decompress other than studying. It’s a good way to remind us medical students to try and maintain the parts of our identity that are not expressly involved in our medical education. If you had the opportunity to talk to a health profession student, what would you tell him/her? I’ve had the pleasure of being a resident assistant (RA) for SHPEP scholars at the University of Iowa, and a former SMDEP student. As an RA I lived with SHPEP scholars and was a medical student contact for them. A common concern that I heard from the scholars was the fear of being inadequate in some way. In addition to concerns about their GPA, needing more impressive extracurricular activities, and not feeling smart enough. These are all compelling narratives that float across our minds. However, the most insidious belief is that we are the only one feeling this way. The fact of the matter is we all have these thoughts. The most important thing I can tell a future health professional student is that you are not alone in however you are feeling. Everyone who has been successful has felt exactly the way you do at some point in their journey. As you embark on your own journey, I encourage you to find a mentor. Find someone who is invested in you, someone who can be role model, and someone who is doing what you would like to one day do. Find a mentor, learn their story, and allow them to know more about you, so they can properly advise and support your goals. How Did SHPEP influence you? When I was in the program in 2014, I was in an extremely unique situation compared to my usual environment. For the first time, I was surrounded by people who were all chasing similar dreams. Not only that, most of them looked like me too. 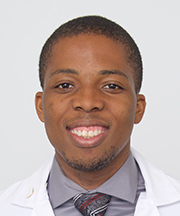 There was a reassurance that came with seeing that I was not the only black male trying to pursue a career in medicine. After SMDEP, I felt like a career in medicine was possible for me. SMDEP pushed me to keep walking toward my goal.